Hero Emblems is one of the best iOS games I've played in a long time. There are no IAPs and the game feels like a complete package with tons of content to go through, fun core mechanics and enough challenge and character customization to not feel bored of it. You play a party of four characters - mage, healer, paladin and fighter - and you match emblems to attack, defend or heal yourself. It's a classic formula turned into an amazing little game. The way the game goes is quite simple, you move around a map, doing quests, sometimes getting hit by random encounters which help you level your team and get gold. The way you fight is by matching icons of the same type. Match three sword icons and your fighter will attack. Match four and he'll attack twice and create a skill icon. Match five and he'll attack three times and create an icon you can match with anything to unleash a powerful skill. 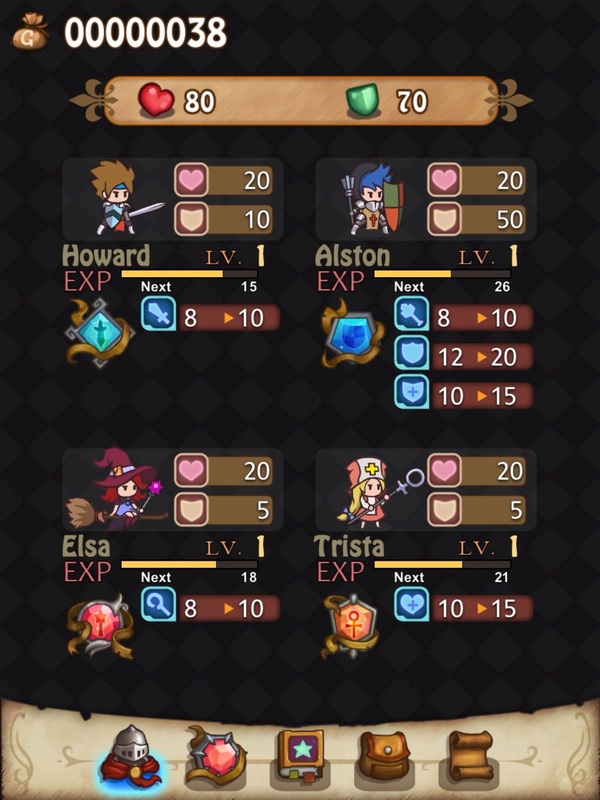 Skill icons activate various skills selected on each of your characters and if you match them in a 4 or more move, they become stronger. After you've attacked a number of times, enemies attack you, reducing your armor and your health. It's not exactly clear how armor protects your health or if certain enemies deal more armor than health damage. In order to restore your armor, you can match shields and hearts to heal yourself. If your armor is full, the paladin will attack enemies, it's a bit annoying that the cleric can only heal and won't do anything special if you're already at max life, making her only useful in certain specific situations. Enemies get challenging quite fast with all the status ailments they can inflict on your party, like locking your tiles or poisoning them. Some of these hinder your board control and some deal damage to you. You cure these ailments with certain skills, items or by matching them. Some ailments take more than one match to be cured and it's also not clear how many they need. Navigating through battle maps takes you through splitting paths of your choice and sometimes you can go in circles in certain dungeons if you take certain paths. At the end of most dungeons there are bosses that you have to kill, they're quite tough and need luck and good emblems. If you die during a map, you lose the gold and experience you would've gotten otherwise. This is the most tiresome issue with Hero Emblems for me since if you've spent time and items in a dungeon, it doesn't amount to anything. You should be able to keep the gold and experience because otherwise you just need to go somewhere else to grind. Gold is used to buy usable items, emblems and skills. The emblems are very expensive but they're the only piece of gear your characters have and they improve what they can do. I always leveled the paladin first since he could attack, protect my party and restore it's armor. It's a bit of a shame the other characters are one-trick ponies. Completing quests net you gold and you can sometimes find skills and emblems in chests, but it occurs rarely. There are a few other things the game could do better, it should be possible for you to select what enemy you want to attack and all enemies should have a visible health bar. Sometimes when you kill a monster your characters will attack the air where it stood, sometimes they'll move to the next bad guy, which is inconsistent. But otherwise, a few weeks playing it and I'm still having a great time. Barring some huge change or bug or the discovery of a game as good, I'll probably be completing Hero Emblems in the following weeks. If you like match-3 puzzle games and RPGs it's probably right up your alley, I recommend it.